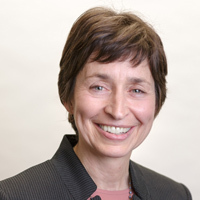 Diane Gould was appointed President and CEO at Advocates in 2013. In a career at Advocates spanning more than thirty years, she has held numerous clinical and leadership roles and directed a broad range of clinical, residential, and support services that promote empowerment, inclusion, and health equity. In the broader community Diane is an active board member of the Massachusetts Providers Council and several other industry advocacy organizations. Throughout her career, Diane has worked to build diverse, inclusive community coalitions that address mental health and social service needs. She is a founding member and former co-chair of the MetroWest Mental Health and Substance Abuse Task Force, a coalition of community organizations, state agencies, and persons in recovery. Diane’s several community recognitions include the 2011 Deborah Blumer Community Health Leader Award from the MetroWest Health Foundation and the 2015 MassPRA Public Advocacy Award. Diane holds a Master of Social Work degree from Simmons College, and the values of the social work profession continue to inform her vision and leadership. Previously, she earned a Bachelor of Arts degree from the University of Massachusetts with a concentration in English and Women’s Studies.